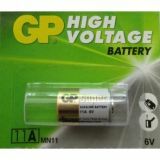 GP Batteries is amongst the leading manufacturers and exporters of batteries (rechargeable batteries, alkaline and button cell batteries) and related products and accessories. The company offers a wide range of quality standard, specific and rechargeable alkaline batteries, as well as universal and specific chargers with various extras. Since its foundation in 1991 in Hong Kong, GP Batteries rapidly expanded and evolved to become one of the major suppliers of primary and rechargeable batteries in the world. 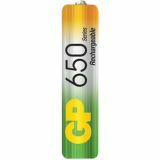 At present, GP Batteries is the largest manufacturer of consumer batteries in China. GP Batteries provides a wide range of batteries and accessories to a number of producers, leading companies in the industry, as well as at consumer retail markets under its own brand GP. The production capacities of GP Batteries are located in Singapore, Hong Kong, China, Taiwan and Malaysia, while marketing and sales offices are in Asia, Europe and North America. The company currently employs over 8,000 people worldwide and occupies a total area of ​​about 312,000 sq. m.
To ensure the quality of their products, GP Batteries comply with the following certificates of international standards: Environmental Management System - ISO14001, Quality Management System ISO 9001: 2008, ISO / TS16949, Social Accountability SA800; ISO26000, IECQ-QC08000 and many others covering as well as single products but also the company as a whole. GP believes that only by consistently producing premium quality products, that serve all needs of their customers can build a reliability and stability of the brand. They never stop innovating and looking for new solutions that are both environmentally and economically effective. 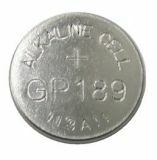 VIKIWAT Ltd. offers a variety of alkaline, rechargeable, button celll and other types batteries with GP Batteries brand. In our stores, you can find in stock quantities, competitive prices and fast delivery. Battery charger for 4 x AA / AAA, Ni-MH rechargeable batteries Charger for four rechargeable Ni-MH (nickel metal hydride) batteries size AA or AAA. Alkaline Battery LR03, AAA, 1.5VDC Alkaline battery type AAA for professional and general purpose applications with nominal voltage 1.5 VDC. Alkaline Battery E11A, 6VDC Special alkaline battery E11A, 6 VDC, suitable for car remote controls. External GP battery, 5VDC, 2A, 10000mAh, black Comfortable and easily portable external USB battery to charge all mobile devices such as phones, smartphones, tablets, mp3 players, cameras, and more. The kit includes a USB to micro USB cable. Power bank. External GP battery, 5VDC, 2A, 5000mAh Comfortable and easily portable external USB battery to charge all mobile devices such as phones, smartphones, tablets, mp3 players, cameras, and more. The kit includes a USB to micro USB cable. Power bank. Button cell battery, LR43, 1.5V, alkaline Alkaline battery with rated voltage 1.5 V.
External GP battery, 5VDC, 2A, 10000mAh Comfortable and easily portable external USB battery to charge all mobile devices such as phones, smartphones, tablets, mp3 players, cameras, and more. The kit includes a USB to micro USB cable. Power bank. 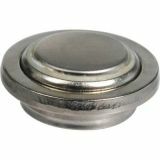 Button cell battery, LR41, 1.5V, alkaline Alkaline battery with rated voltage 1.5 V.
Battery R14 1.5V C, GREENCELL GREENCELL alkaline battery for professional and home use. 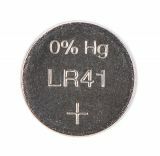 The battery is type C (14G R14P). Battery 10A, 9VDC, 38mAh Special alkaline battery GP 10A 9VDC voltage and capacity 38mAh. Battery V625U 1.5V Battery V625U with rated voltage 1.5V. List Price 2.80лв. VAT Incl. 2.65лв. VAT Incl. 2.52лв. VAT Incl. Universal portable battery GP, 5VDC, 2.1A, 5200mAh Comfortable and easily portable external USB battery to charge all mobile devices such as phones, smartphones, tablets, mp3 players, cameras, and more. The kit includes a USB to micro USB cable. Power bank. Universal portable battery GP, 5VDC, 5200mAh Portable charger with Lithium-ion rechargeable battery with capacity of 5200 mAh and USB output. Fully charged device can charge 8 times one standard smartphone. Power bank. List Price 4.40лв. VAT Incl. 4.18лв. VAT Incl. 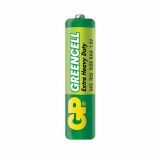 Alkaline battery GP LR06, 1.5VDC, AA Powerful single use battery of the GreenCell AA series for universal use. This battery is perfect for both intense professional use and home applications. Rechargeable Battery 1.2V 1350mAh, 4/5AA Rechargeable battery with a nominal voltage of 1.2 V and a capacity of 1350 mAh. Alkaline Cell Battery AG10, 1.5V, 50mAh Alkaline Coin Cell Battery AG10 with voltage 1.5 V and capacity 50mAh. 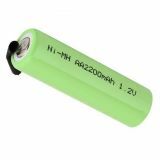 Rechargeable Battery 1.2V 2200mAh, Ni-Mh Rechargeable battery with voltage 1.2 VDC and capacity 2200 mAh.